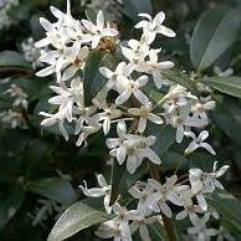 Osmanthus is a genus of about 30 species of flowering plants in the family Oleaceae, mostly native to the warm temperate zone, from the Caucasus east to Japan, with one species occurring in the southeastern United States, from Texas to Virginia. It is sometimes included in Nestegis. 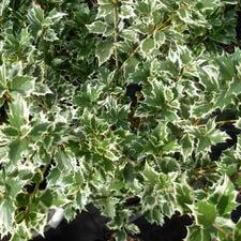 Osmanthus range in size from shrubs to small trees, 2-12 m tall. 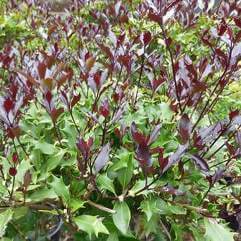 The leaves are opposite, evergreen, and simple, with an entire, serrated or coarsely toothed margin. 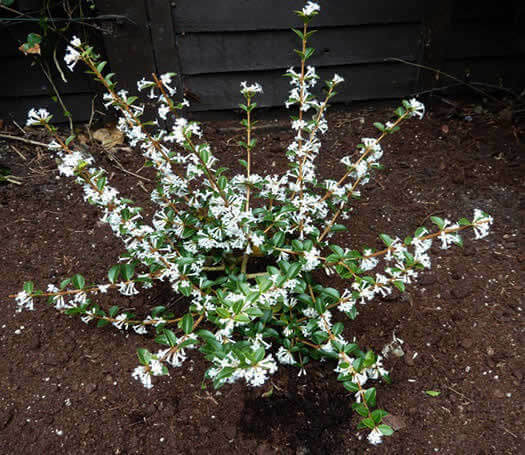 The flowers are produced in spring, summer or autumn, each flower being about 1 cm long, white, with a four-lobed tubular-based corolla ('petals'). 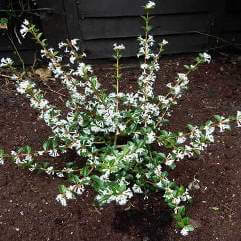 The flowers grow in small panicles, and in several species have a strong fragrance. The fruit is a small (10-15 mm), hard-skinned dark blue to purple drupe containing a single seed.